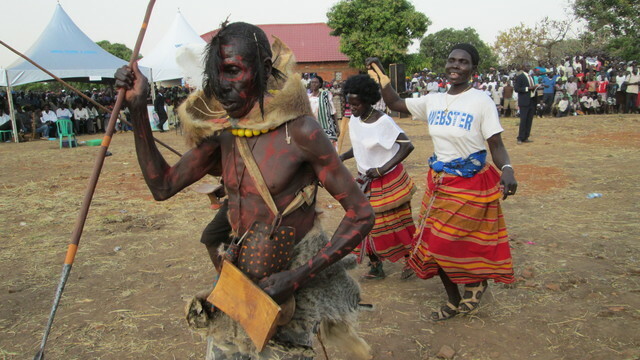 Luo culture is famed for marking the rites of life in song and dance. Dancing the Otole at a funeral is symbolic of the honourable vision of facing death fearlessly. 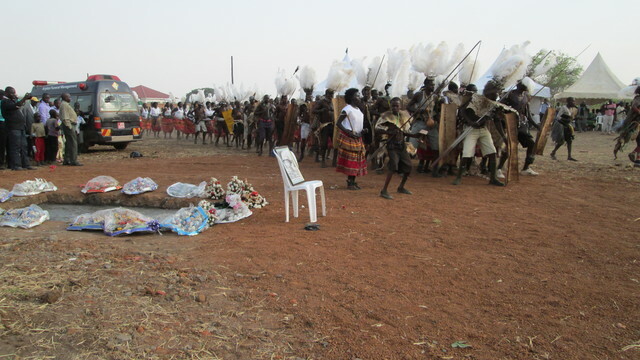 Emblematic themes which guide the dance are: appeasing the spirit of the deceased, eulogies for gallantry in the past, unity and continuity of the Acholi community. 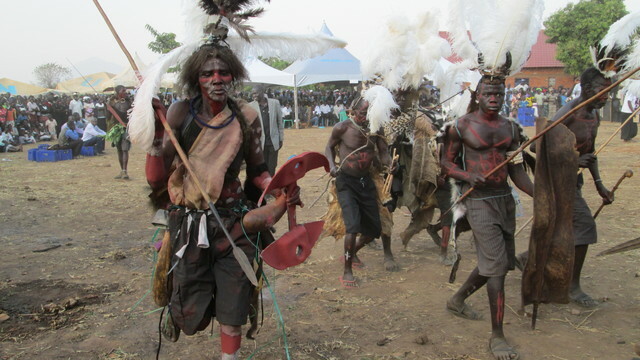 This is Latolim Otole dance Troupe of Madi Opei Sub County in Lamwo district. 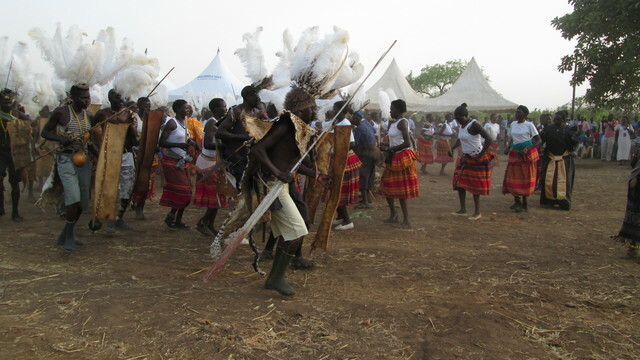 The Otole dance was performed in commemoration of the late Lt Gen Bazilio Okello Olara, former commander in chief of Uganda National Liberation Army (UNLA). He was considered a warrior for his struggle against colonialism and in his subsequent career in the armed forces of Uganda. The Uganda People’s Defence Forces repatriated the remains from Omdurman on 13 February and reintered them in Uganda on 14th February 2015. 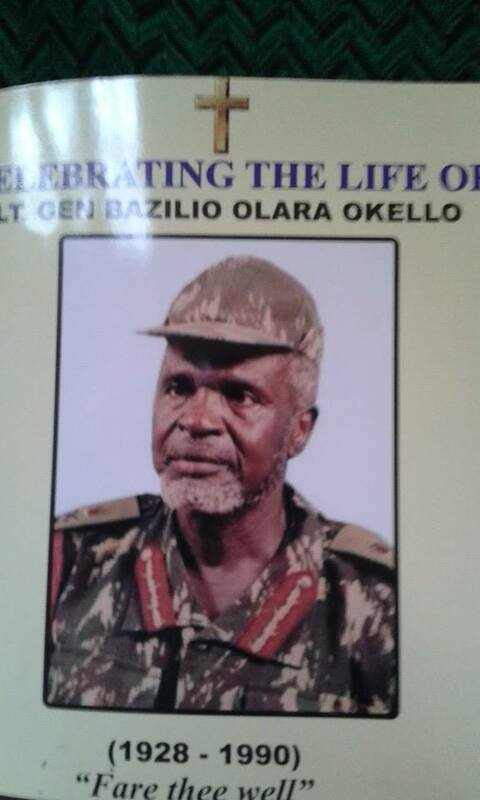 Lt. General Bazilio Okello Olara passed away in 1990 at Omdurman Hospital Khartoum, from complication of diabetes. He had sought asylum in Sudan after the National Resistance Army (NRA) took over power in 1986. 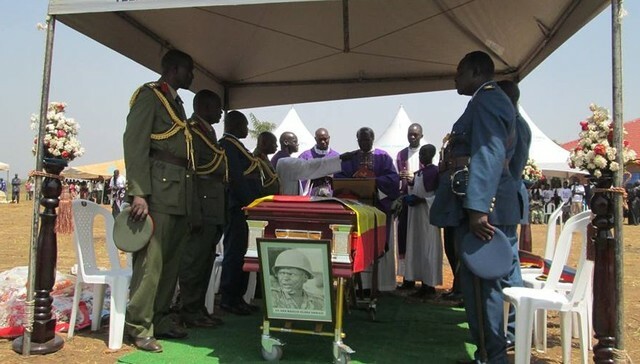 The remains of Lt. Gen. Bazilio Okello Olara were interred at his ancestral home in Poyamo village, Madi Opei Sub County, Lamwo district. Elderly dancer in war paint: red ochre , charcoal. On his neck are the fruit of a solanum plant. Ladies are wielding wooden spoons, not the traditional hand axe. White and black ostrich feathers adorn an Elder’s head. He is symbolically chasing away the spirit of death.